I've often thought that I am not a big fan of stories set in space. But that really doesn't hold up under careful examination. 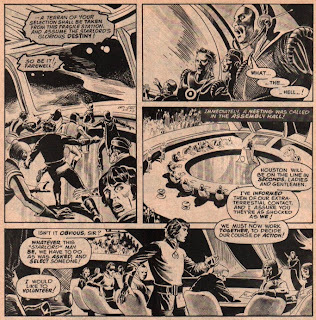 Like most guys of my generation, some of my earliest memories involve my obsession with Star Wars. One of my favorite books is Ender's Game by Orson Scott Card. I loved the Transformers with every inch of my little adolescent heart. So, where exactly, did I get this notion that I don't like space epics? I got it from comic books. 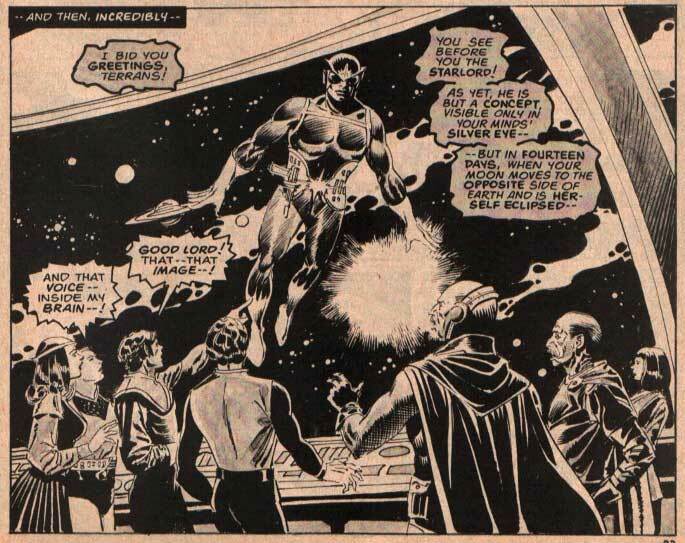 Most spacefaring comic books that I read as a kid were dreadfully boring (I'm looking at you, Quasar!) The heroes all seemed to have similar, undefined power sets. The villains weren't terribly interesting. 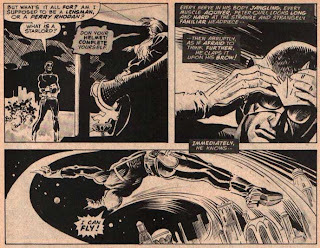 And, like I've said once or twice before, I grew up reading Spider-Man, who works best with his feet set firmly on the New York pavement (or rooftops). Greatness would come with the sequel, Annihilation: Conquest, and a little series spinning out of that called Guardians of the Galaxy. Now I was hooked. Not only was Bug (of my beloved Micronauts comics) along for the ride, but there were so many other great characters I had discovered along the way. Rocket Raccoon, Gamora (the deadliest woman in the galaxy), and Groot, just to name a few. 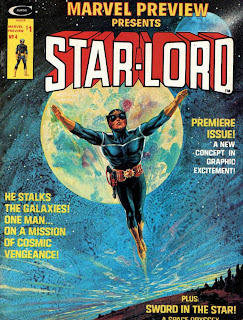 Leading them was this surly, manipulative jerk of a character I had never even heard of before, by the name of Star-Lord, and he was magnificent. 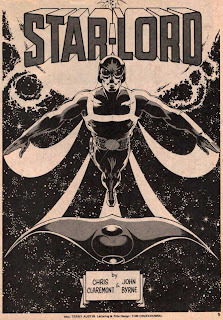 Keith Giffen, and Abnett and Lanning went deep into their Official Handbooks of the Marvel Universe for these events, and Star-Lord is probably the most perfect example of that. Plucked from obscurity (after barely appearing at all for the past 30 years) and reinvigorated to the point that he's now possibly going to be starring (along with the other Guardians) in a big budget Marvel Studios movie. Well, I aim to fix that right now. 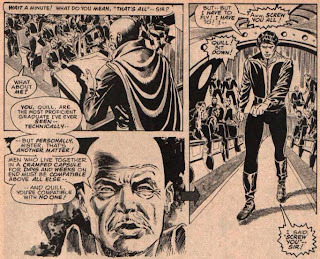 Come along with me, as we go all the way back to 1976, as Marvel experiments with some harder-edged stories in a magazine called Marvel Preview. Does anyone know the artist for this? In the Western United States, there is the cry of a child being born. This was happening at the same time as a rare astronomical phenomenon, which usually coincided with important moments throughout history. 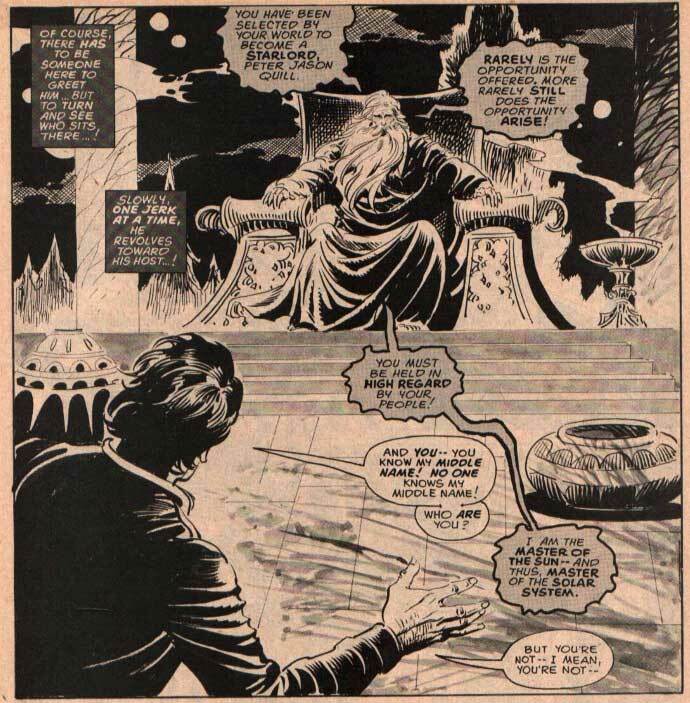 (Englehart was big into astrology at the time.) The father of the baby is crazed, is convinced that the child is not his. He rips the baby from his mother's arms and runs out into the night. He grabs an ax, intending to kill the child, but collapses from a heart attack before he can. The baby lies there on the ground, looking up at the stars. A nice image, but completely impossible for a newborn baby. The baby grows up to be Peter Quill. He was absolutely obsessed with space and the stars. His mother, Meredith, would tell him stories of alien landings on Earth, but always end with "There's no such thing as flying saucers," until one summer day, Peter comes upon an actual flying saucer landing in the forest. He runs to get his mom, and together they return to investigate. 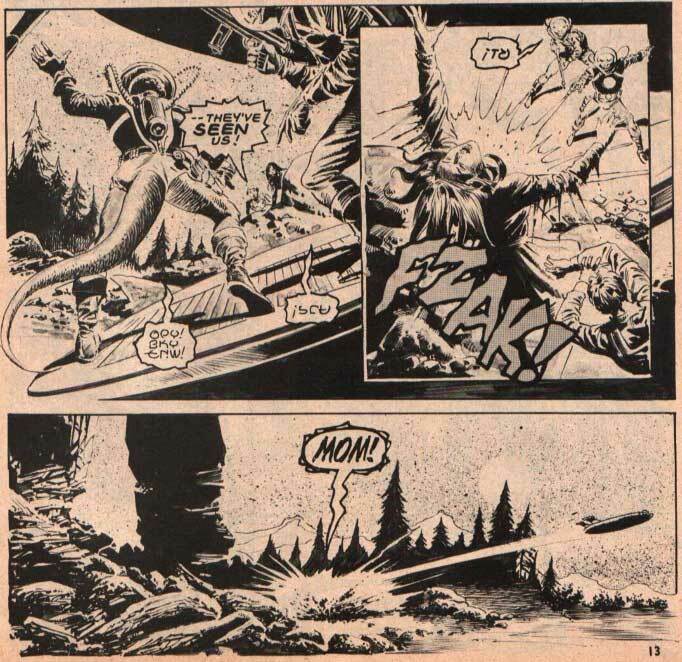 It does not end well for her, as she is blasted and killed, with the flying saucer immediately speeding off. The town sheriff comes to collect the body, but refuses to believe Peter's crazy stories of alien assassins. 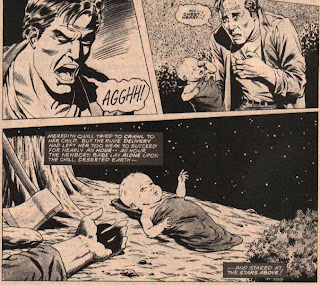 Before being taken off to the orphanage, Peter makes a solemn vow to avenge the death of his mother. Many years later, Peter is in the NASA training program. He is one of the top trainees when it comes to technical proficiency, but his personality leaves everyone else cold. He's an introverted jerk. 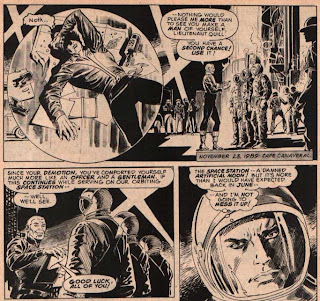 One day he even saves another top trainee, Greg Harrelson, from a centrifuge accident, but proceeds to belittle him for not saving himself immediately after. 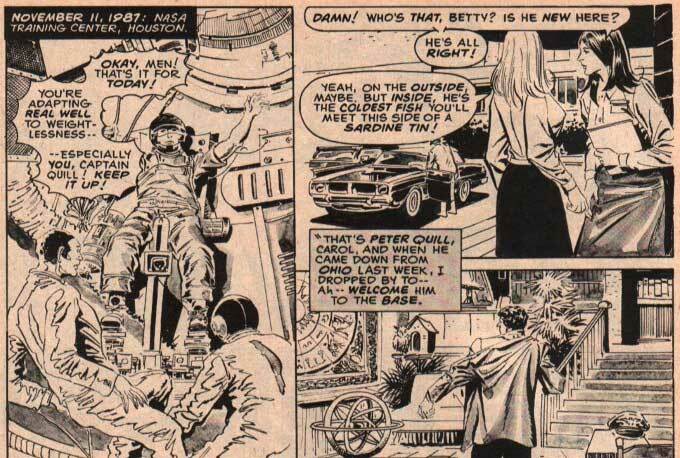 Upon completion of the program, when everyone is getting their future assignments, Peter Quill is passed over. His abrasive personality is not conducive to a team environment aboard a space shuttle or station. An angry Peter returns to his room, and drinks himself to the point of passing out, all the while lamenting his failure to get to the stars. A few months later, after behaving himself, Peter finally gets a second chance. He's been assigned to a space station. Later still, Peter looks out into space from the deck of the space station. He had finally achieved his goal to reach the stars. An eclipse was scheduled to happen, and the crew gathered around to witness it. 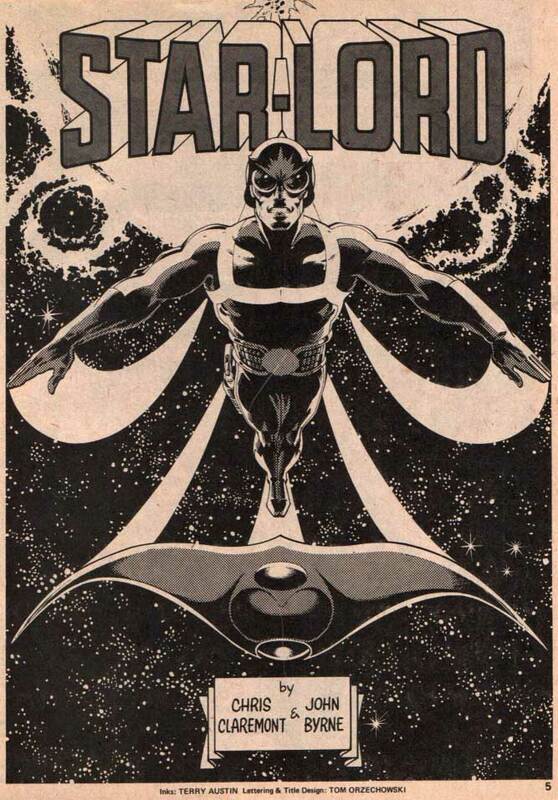 What they witness instead, is the arrival of a strange being calling itself a Star-Lord. It tells the crew that in fourteen days, it will return where a person of their selection will be taken, and "assume the Star-Lord's glorious destiny." A meeting is called in the assembly hall. Peter thinks the course of action is obvious, to select someone as the being said, and he volunteers himself. The high command rejects the idea and rejects him. Peter destroys the viewscreen in his rage. He is taken captive and locked away. He once again seethed over the loss of another opportunity to reach his ultimate goal. Even worse, the command had decided to follow his advice after all, and selected Greg Harrelson as their candidate. Peter Quill would not accept this. 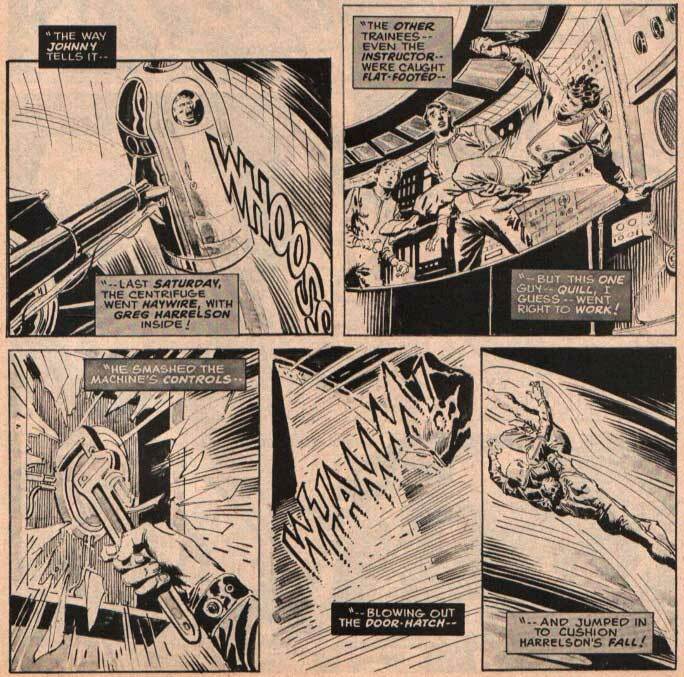 He knocks out his guard, steals a vessel, and makes his way back to the central space station. He kills every soldier in his path. 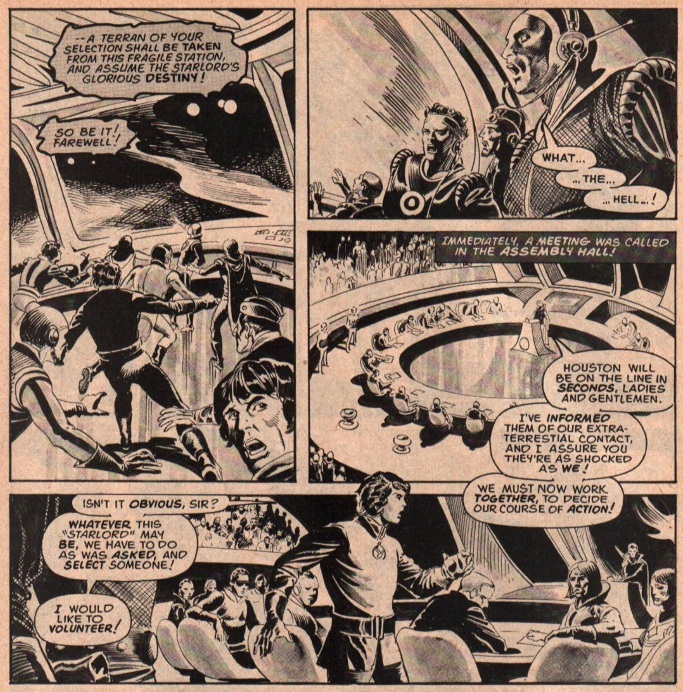 Peter makes it to where the generals have gathered with Greg, in preparation for the arrival of the strange being. Peter is merciless, gunning down each and every one of them. As he is slowly surrounded, they fire upon him, but it is already too late. He had been whisked away. Peter finds himself traveling through space, until he arrives at an alien city. A being calling himself the Master of the Sun is sitting upon a throne. He tells Peter that he has been selected to become a Star-Lord. In the blink of an eye, Peter is equipped with the Star-Lord costume and weaponry. He now has the ability to fly, and the gun has the ability to shoot fire, water, air, and Earth; giving him control over the four elements. The Master of the Sun now reminds Peter of his vow, to avenge the murder of his mother. 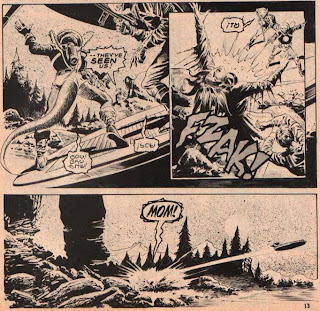 Before he can even finish his answer, Peter finds himself in the middle of space again, under attack from flying saucers just like the ones that attacked his mother. Peter, as Star-Lord, attacks the alien creatures and kills them all. Immediately after, he once again finds himself back at the alien city with the Master of the Sun. Having finally fulfilled his lifelong goal of vengeance, Peter now looks to the future, and what comes next. My brain thoughts: If you didn't know any better, this reads like the origin of a future villain. 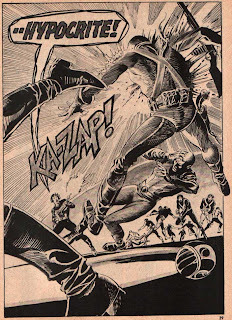 Quite a harder edge than you might suspect from Marvel superhero comics at the time. 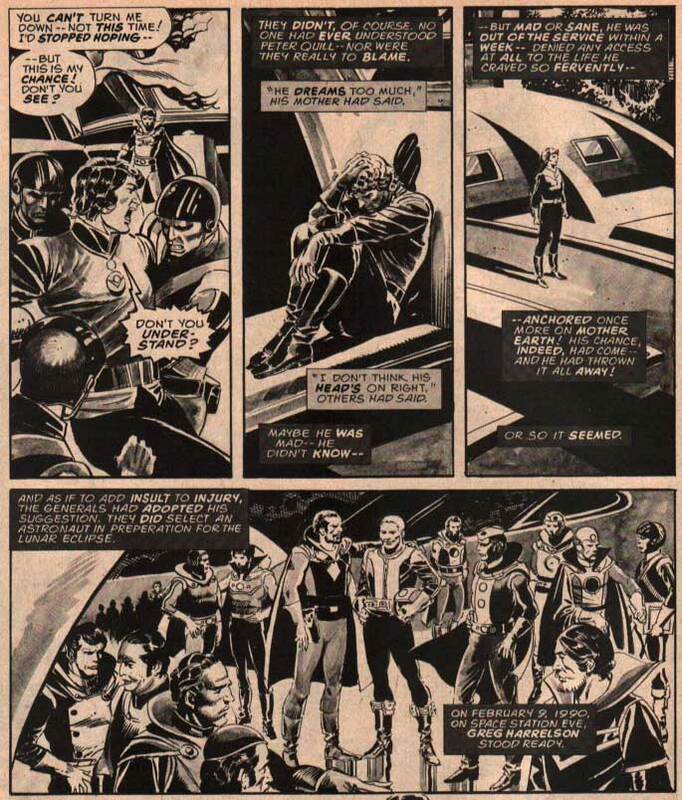 That seems to have been the hallmark of the Marvel Preview series, with the black-and-white magazine format attracting creators that wanted to tell grittier stories. 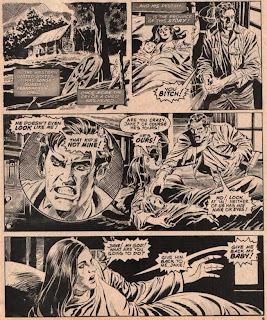 (The Punisher himself finally got an origin only a few issues earlier in the magazine.) 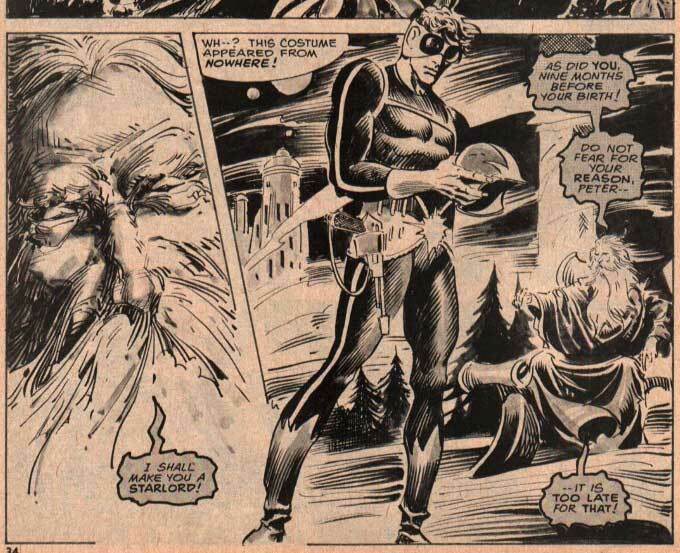 When I discovered Star-Lord in the modern era, he was still manipulative and a bit of a jerk, but also very much a hero. 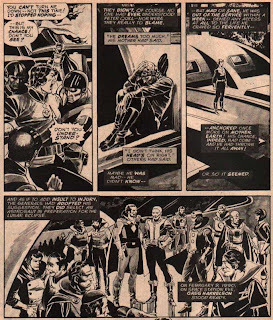 It had been Englehart's plan all along to make the character extremely unlikable at first, before eventually growing into the role of a hero, but Englehart left the company before he could finish this process. 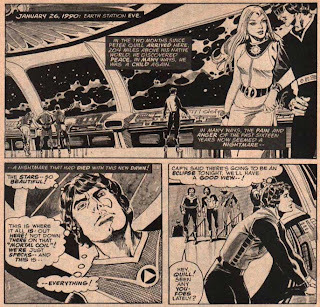 This issue is notable for being the first collaboration between Claremont, Byrne, and Austin. 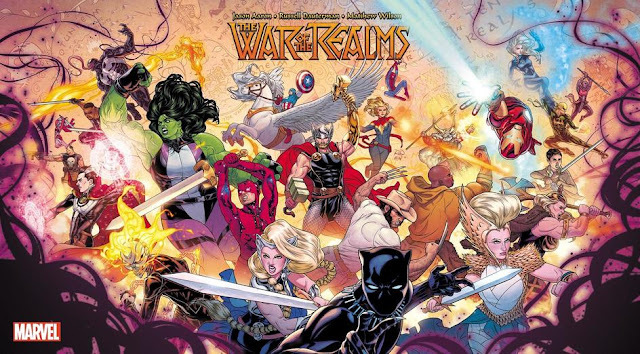 (Just like with my childhood favorites Iron Fist and the X-Men, this creative team would once again be involved in a favorite character of mine. Only this time, I would become a fan of Star-Lord much later in life.) This is a standard superhero space adventure, involving Star-Lord banding together with some slaves to destroy the slaving ring that kidnapped them. My brain thoughts: This issue, and subsequent Star-Lord appearances in Marvel Preview, would remake the character into much of your standard space hero, out on fantastic adventures. Pretty standard stuff, and nothing I would recommend anyone go out and find right away. 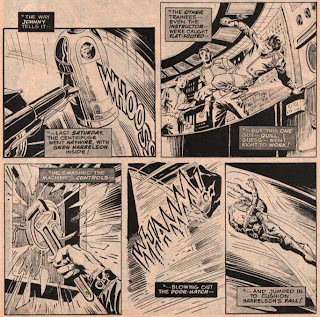 The highlight is the John Byrne art, which looks very good considering how inexperienced he must have been as a sequential artist at the time. 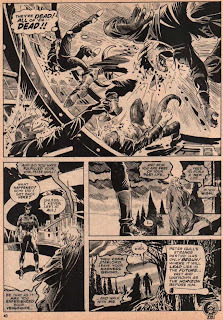 (I promise you, I don't intend to turn every column into a Claremont and Byrne lovefest. It just happens!) 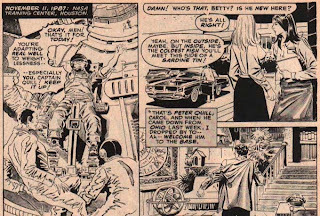 This just goes to prove that Austin had much more of an influence on the quality of Byrne's art than he usually gets credit for. Marvel Preview #18 features some early art from Bill Sienkiewicz. 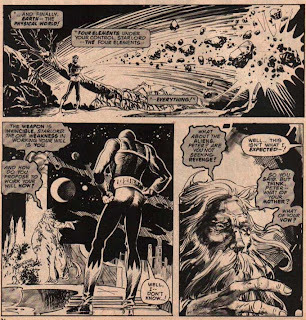 Later stories revealed that Peter's true father (see, that man was right after all) was Jason of Spartax, the son of the galactic Emperor, and the Star-Lord directly before Peter. 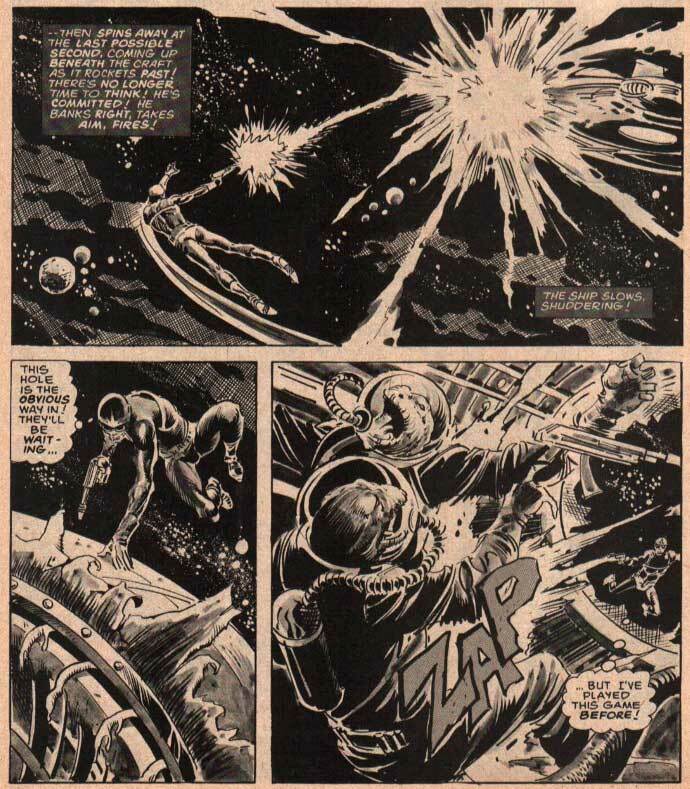 It was also revealed that the death of his mother was not an unfortunate circumstance, but that she was purposefully assassinated by the aliens that killed her. 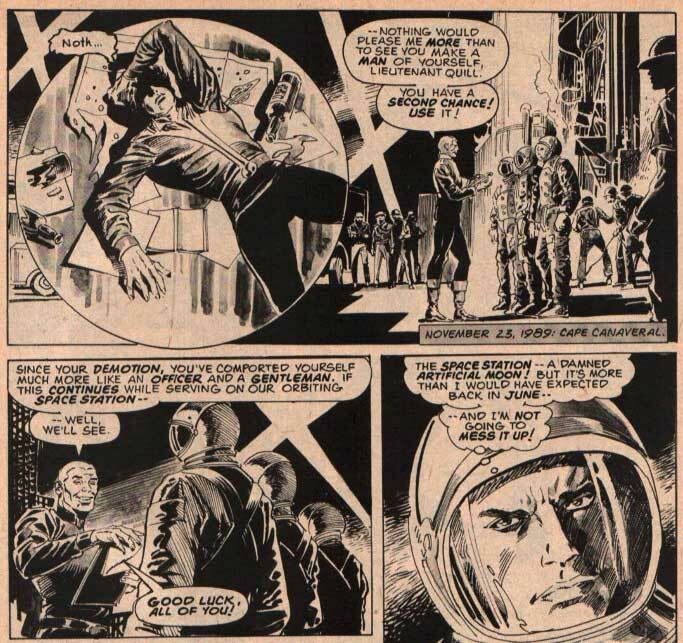 My final brain thoughts: Assassinations by aliens, treachery, subterfuge, John Byrne, and eventually...redemption? Star-Lord is a perfect example of that. Debuting in an obscure black-and-white comic magazine, abandoned by his own creator after one story, this was a character that could have disappeared forever. Thankfully, that would not be the case. I hope you enjoyed this little teaser about the Marvel Cosmic universe. 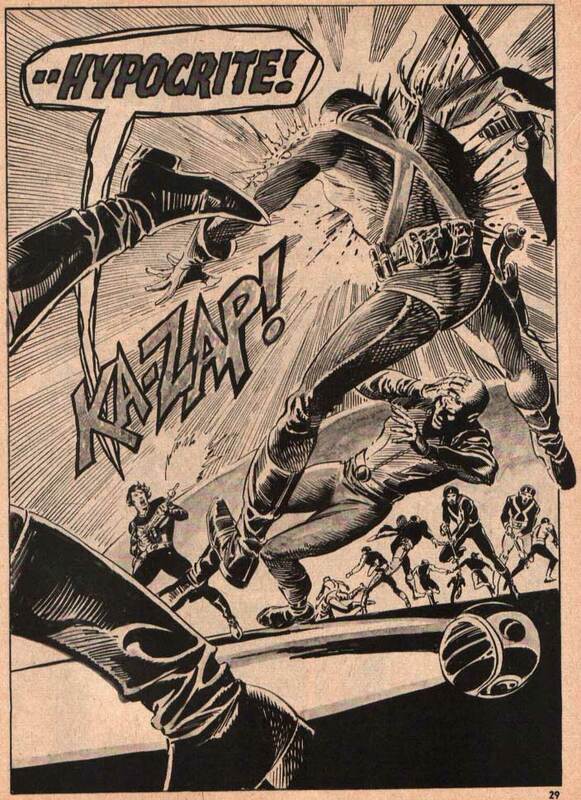 I plan to cover much, much more of this material in the future, so keep on coming back to the Comics Cube for more. Next time on Guarding the Galaxy: Thanos? 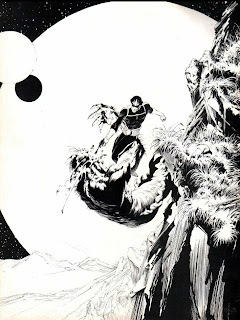 Late to the party, but a quick Google search suggest Bernie Wrightson as the artist of the image just below the introduction.